Did you realize that leaking gutters could make severe damage to your home or office if not fixed sufficiently early? Water may accumulate on the roof of your house due to rain, snow or ice causing considerable damage to the roof, walls, sidings, and foundation of your house. In order to maintain the hygiene of your house and protecting it against possible water damages, it is extremely important to install gutter guards and downspouts on your house roof. We ensure the gutters and downspouts of your house are functioning properly. If you are dealing with a leaking gutter, our “Factory on Wheels” will come to your house and fix it to the best of our abilities to ensure your property is not affected by water damage. If the gutters and downspouts are old and need to replace, our skilled installers will show you different options available to replace them. We are the best local gutter contractors who will provide you the best solution for your home or business! 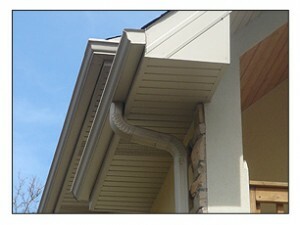 We also do aluminum gutter installation in Chicago region. Our seamless Aluminum Rain Gutters are pre-painted with a heavy baked enamel finish. We provide the biggest color choice in Chicago region. With so many options, our customers can be assured that we have something for everyone to suit their home improvement requirements. Our Gutter Specialist will be happy to help you select just the right size and color to fit your needs. Contact Us Today!